“We’ll be right in their kitchen so it’s gonna happen fast,” said Rick as we exited the suburban with the first signs of twilight to the east. The cool, crisp Kansas air was eerily calm that November morning in 2014 as we snuck single file up the side of the red dirt road. After a short hike, we reached a small rise and I could finally see why Rick Paillet, The Verminator, regarded this stand as one of his all-time favorites. “Cats or coyotes, you just never know what’s going to show up on this one,” he whispered with a grin. To the south of the road was a rolling expanse of hills and creek-bottoms covered in vegetation ranging from small cedar trees and hardwoods to red CRP grass and green winter-wheat. Running perpendicular to the road was an old stone fence which provided us with an easy solution to splitting up coverage on the stand. Brady and Tim elected to cover the east side of the fence overlooking a thick creek-bottom separated from them by 100 yards of winter-wheat while Rick and I would cover the west half. Following a few less than meaningful hand signals and some animated thumbs up, we each headed down the stone fence line to find our spots. Slowly weaving in and out of the brush and small rock piles, Rick and I gradually made our way about 100 yards down the gentle slope of the hill. “There’s an awesome little pinch point up here another 20 yards or so. Gonna be pretty tight but there are just enough openings to give us some quality shots,” Rick explained. As we arrived at the spot, my optimistic daydreams of the anticipated success we would have were confirmed. 75 yards below us was the main creek-bottom running east and west. It was filled with a dense combination of hardwoods and scrub brush. A small finger of the creek bed filled primarily with scrub brush and a few scattered hardwoods jutted up the hill stopping about 20 yards from our position. East of the finger was a 30-yard gap extending all the way to the main drainage that was filled with short-grass pasture and an occasional cedar tree. Shielding the east side of this semi-opening was the stone fence with Tim and Brady on the other side. West of the finger was a gradual up-sloping hill covered in red CRP grass splattered with a mixture of small cedar trees and scrub brush. While Rick was busy tucking himself and the camera into a pocket of brush, I slipped out halfway between our position and the end of the finger and placed the Lucky Duck Screamin’ Joker. This decoy/e-call hybrid would be used in conjunction with one of Rick’s signature Verminator hand calls. Less than a minute into Rick’s first series he spotted the first two coyotes rolling off the hill west of the finger. The low-light and red grass made then somewhat of a challenge to spot but within a few seconds I had adjusted my rifle and we were hastily coordinating the kill on camera. During this exchange, Rick activated the Screamin’ Joker which would hopefully draw the attention off of us and onto the decoy. 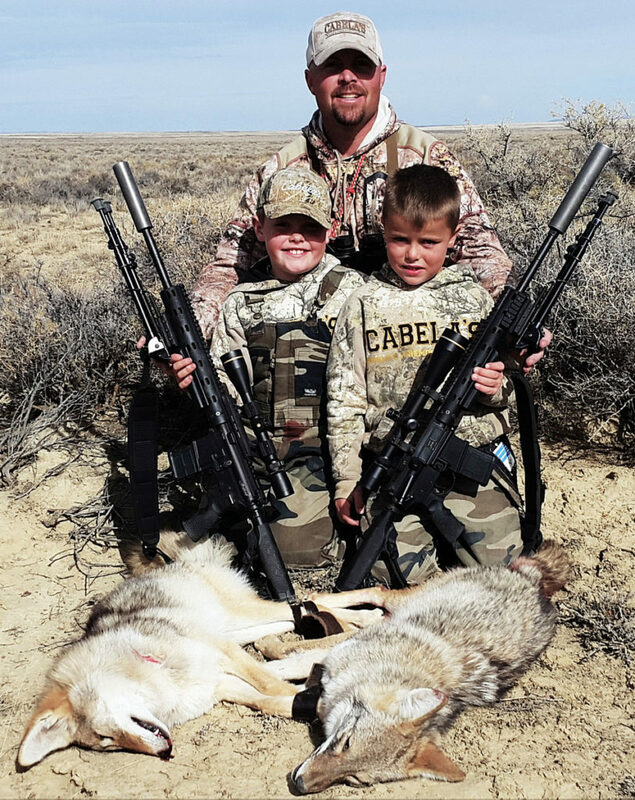 With our coordination nearly complete, I picked out the coyote to the left standing chest-on at 80 yards and began to pull the slack out of the trigger. Just then, I caught the movement of a third coyote emerging from the finger off to the left. As it trotted up to the decoy, Rick and I made a swift change in our plan and the ambitious coyote dropped dead in its tracks two yards from the Joker. After a quick shift, I was surprised to find the original coyote in my crosshairs still standing chest-on where I had left him a few seconds earlier. “Snap, THUMP!” The suppressed Daniel Defense 5.56 was making quick work of the clueless targets. The third coyote educated itself rather quickly and made it back over the hill they had come from before I could draw a bead. Wide-eyed and quietly giggling like school girls, Rick and I began reliving what had just occurred seconds earlier. The celebration was abruptly cut short when a fourth unsuspecting coyote trotted out from behind some scrub brush on the far side of the finger and stopped. The 53 grain V-Max covered the 60-yard gap in the blink of an eye and in a span of 18 seconds, I capitalized on a rare opportunity at an unassisted triple! Looking back on this extraordinary stand, multiple factors led to our success. Being in the right location, using an enticing sound and executing the shots are probably the first contributing factors one would think of. Throughout the remainder of the article, we’ll take an in-depth look at several factors that may have played an even more important role in our success like understanding why and when coyotes use cover, how it affects their response to the call and how to apply that understanding to your setup. Understanding why and when coyotes use cover begins by understanding their daily routine. Late afternoon, all night and early morning are when coyotes spend a majority of their time on the hunt. Cover is important during this feeding time because higher densities of prey can normally be found where the thickest cover gives way to less dense areas. Agricultural fields transitioning into hardwoods, river bottoms into pasture and sage flats into rocky outcroppings are just a few examples of transition areas. During these times, coyotes will generally be on the move and in positions where they have visibility of the surrounding area. As the sun climbs higher into the sky, coyotes transition back into the denser or rough cover. These secluded bedding areas allow the coyote to escape the higher mid-day winds and provide a sense of security while the coyote recharges for the upcoming hunt. Weather, hunting pressure, surrounding terrain and time of year all play important roles in determining how long coyotes spend each day in these bedding areas. In many cases, it’s not unusual for a coyote to spend upwards of 75 percent of daylight hours bedded up. Next, let’s discuss a coyote’s comfort zone or how far they are willing to travel to investigate the sound of a possible meal or another coyote. This concept was brought to light early on in my predator hunting career. I was overlooking a beautiful stand full of yucca and washes shortly after lunch one day. Several minutes into the stand, I noticed a coyote sitting off in the distance approximately 600 yards. Although it wasn’t obvious to me then, I now realize that the coyote was bedded amongst a clump of yucca and had probably been sitting there the entire time looking up at my position. I continued to let the wounded jackrabbit play on the old cassette e-caller until eventually, the coyote laid back down and disappeared from sight. I decided to pack up and sneak down closer to see if I could get a shot. As I got within several hundred yards of where I last saw the coyote I realized that the terrain was too flat for me to be able to spot the bedded coyote for a shot. I decided to turn the wounded jackrabbit sound back on in hopes that the coyote would stick up its head and present me with an opportunity. In total shock and amazement, I fumbled with my rifle trying to get off a shot as the coyote nearly ran me over not 20 seconds into my make-shift stand. Needless to say, that coyote lived to see another day and I learned a life-long lesson. The closer I can get to an unsuspecting coyote before I start calling, the better the odds are of getting that coyote to respond. This identical scenario has unfolded multiple times ever since my first encounter many years back and often leaves me scratching my head. Why would a coyote respond to the call from 200 yards and not 600? A simple subconscious decision involving weighing the gain versus the loss is made every time a coyote decides to hunt down the dying rabbit screaming over the hill. The farther they travel the more energy they burn. The more energy they burn the more prey they must catch. Thus the closer the sound to the coyote, the less energy they have to expend to investigate which increases the likelihood that the coyote will respond to the call. Picture an imaginary circle extending out around the coyote representing the distance they are willing to travel. This is their comfort zone. Every coyote is different and factors such as hunting pressure, time of year, the age of the coyote, weather and terrain all play important roles in determining how big or small each coyote’s comfort zone is. A coyote’s circle will fluctuate in size throughout the day as well as throughout the year. During low-light hours when coyotes are on the hunt, comfort zones will generally extend. Add this to the fact that coyotes are on the move and this is why a majority of predator hunters have more success early and late in the day. The zones are bigger so the odds are much better that your setup will be within a coyote’s circle. During the middle part of the day when coyotes hunker back in the thick cover or rougher terrain, their comfort zones contract. Add this to the fact that the wind has probably increased, restricting the distance your call carries, and this is why a majority of predator hunters struggle or even call it quits during the mid-day hours. The zones are smaller making the odds of setting up within a coyote’s circle substantially worse. Understanding how coyotes use cover, being able to identify these areas, and positioning yourself close enough to these areas are all crucial to consistently call in coyotes no matter what time of the day you are hunting. Obviously one will never know exactly how big or small the comfort zone is of the suspected coyote that you are hoping to call in. All you can do is make an educated guess based on the time of day as to if the coyote is hunting in the transition areas or bedded up in deep cover. From there, evaluate the terrain you are hunting and pick out the highest probability areas. Early morning and late in the day we’ll assume coyotes are out on the hunt. This presents an obstacle getting into the stand because these transition areas are often more open which gives the hunting coyote better visibility of the surrounding area. Better visibility equals a better chance of the coyote spotting you while moving into position. Keep in mind that during these times, the coyote’s comfort zone is larger and they are on the move. This allows you more flexibility in your stand and getting in close to the coyote before you start calling is not nearly as important. Often times I prefer to keep some sort of terrain feature between myself and the transition area. By doing so, my visibility may be limited but I assure myself of getting into the stand undetected. Transition area stands will often be longer in length and farther distances apart due to the larger comfort zones. 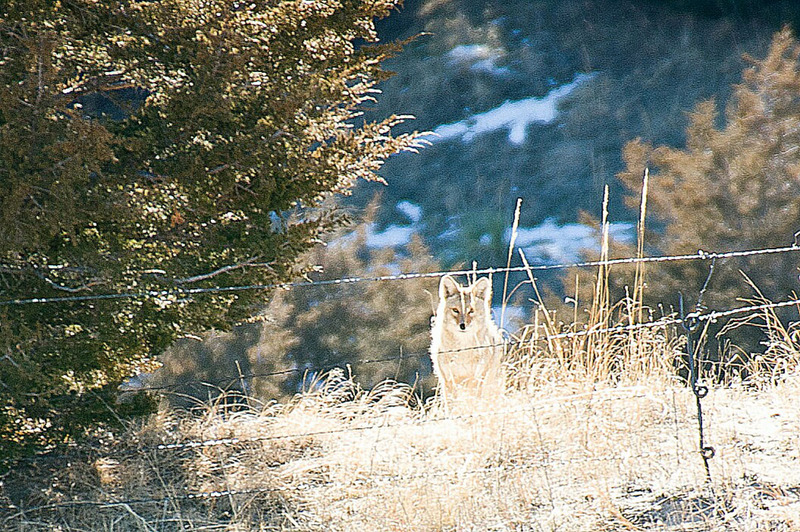 If you are keying on calling coyotes out of their bedding areas, understand that you must get as close as possible to where you think they are bedded to increase your odds. This presents some challenges in itself but with some creativity, stealth, and knowledge of the surrounding terrain setting up within several hundred yards of a bedded coyote can be easier than you think. On the approach into the stand I’m not as worried about being spotted. Bedded coyotes are often tucked away in secluded pockets or thick vegetation so their visibility is limited. This makes their noses and ears the primary defense systems during these times. Bedding area stands will often be much shorter in length and shorter distances apart due to the contracted comfort zones. 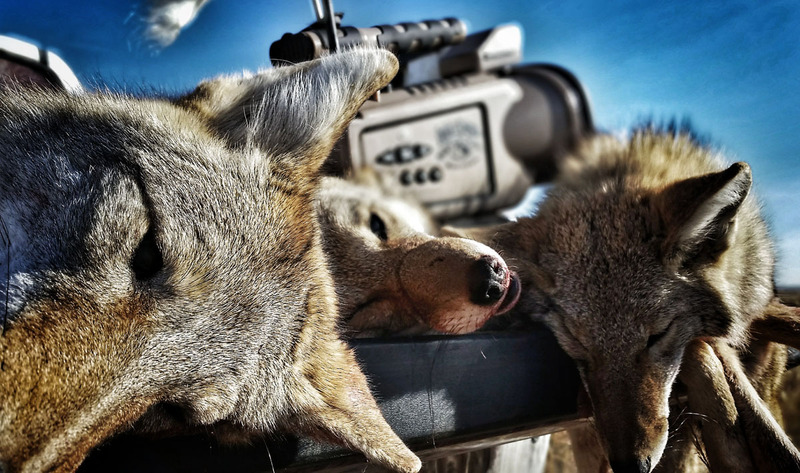 When and why coyotes use cover and how it relates to their comfort zones is an often overlooked aspect of coyote hunting. Understanding this concept and applying it properly will turn your normal morning-only hunt into an all-day coyote killing thump fest! 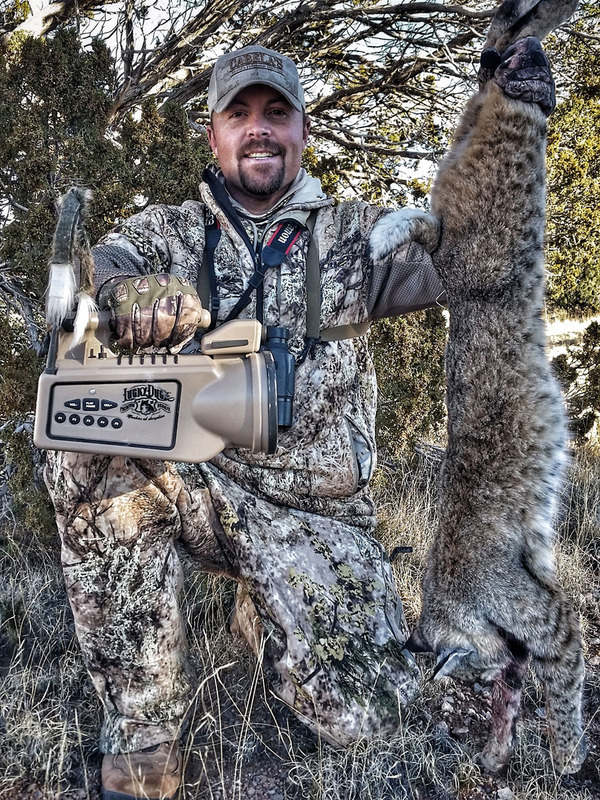 October Coyotes – Don’t Miss Out on Primetime Conditions! Please add the urban areas when discussing coyote habitats. The easiest targets are the neighborhood pets and not game animals. I lived on a scrubbed hillside only five miles from Downtown Los Angeles (NE) and learned a great deal about hunting Canis Latrans while protecting neighborhood pets. Coyotes are a crafty lot and it seems will never be eradicated. I tracked and hunted them for decades and it came down to a standstill. I disliked them for dismembering my cats but had a grudging respect for their ability to answer my challenges (at times raising the hair on the back of my neck upon witnessing their reactions to my stalking them). They have now expanded their territory coast to coast. I didn’t eat them but I sure as hell put holes in the ones who devoured my pets. Oregon now has a law that says if you hit and kill a deer, you can keep it. Used a balloon, blown up and letting the air out slowly, served the purpose for us. We were deer hunting in eastern Oregon and while sitting around the campfire at night, made the squeaking noises with the balloons. Soon we could hear them yowl, then could see their eyes when a flashlight was on them. Never attempted to shoot them, but had fun fooling them. Never handle guns while drinking was out motto. Stop and think before you engage your mouth. If we just ate prey animals the predators would expand their diets to domestic livestock including pets. IE; California. Please think things through before you hit thew keyboard. As far as exposing kids to firearms…you raise your kids and ill raise mine; sound good? Another “Hunter” who has never worked a farm or ranch and had to deal with the scourge of overpopulation of sage rats, jack rabbits and voles. Coyotes play a part in the system and those of us who farm for a living only kill them if we have to. Otherwise we let them do what they do and understand where they fit in. And if this guy is worried about the precious deer population he should come out to the alfalfa fields at night and see how huge the herds are that are busy devouring the crop. In another note, I just looked it up and the stats from Crook County show that 327 deer have been killed by motor vehicles so far in 2018. Don’t kill what you don’t eat. And learn more about the species you ARE killing. Just because you can do something doesn’t mean you should. Leaving prices for pelts might encourage those not quite up to thinning these varmints out to step up. Don’t kill what you don’t eat. This must be arrested for killing animals, on the other hand, those children who are playing with real weapons, this is the future of America, and nobody grabs anything. Think of children killing and playing with real weapons, better teach them to read a book.thank you.